One in four registered voters (27%) thinks global warming is happening, is worried about it2, and would “definitely” (7%) or “probably” (20%) sign a pledge to vote only for candidates who share his or her views on global warming. This translates to more than 10 million3 registered voters who would definitely sign a pledge and more than 30 million who would probably sign one, for a total of about 41 million. Democrats are the most likely to say they would do so (10% definitely; 41% in total). Some Independents would also sign such a pledge (10% definitely; 18% in total), and some Republicans say they would as well (2% definitely; 11% in total). About one in six (17%) registered voters thinks global warming is happening, is worried about it, and would “definitely” (2%) or “probably” (15%) volunteer time to elect a candidate because the candidate shares his or her views on global warming. This translates to an estimated 3 million registered voters who would definitely volunteer their time and about 23 million who would probably volunteer. Democrats are the most likely to say they would volunteer (4% definitely; 31% in total). Some Independents would also volunteer their time to elect such a candidate (3% definitely; 11% in total), and some Republicans say they would as well (4% probably would). Further, about one in six registered voters (16%) thinks global warming is happening, is worried about it, and would “definitely” (2%) or “probably” (14%) donate money to a candidate because the candidate shares his or her views on global warming. This translates to approximately 3 million registered voters who would definitely donate money and about 21.5 million who would probably give to a political candidate. Again, Democrats are the most likely to donate money (5% definitely; 29% in total). 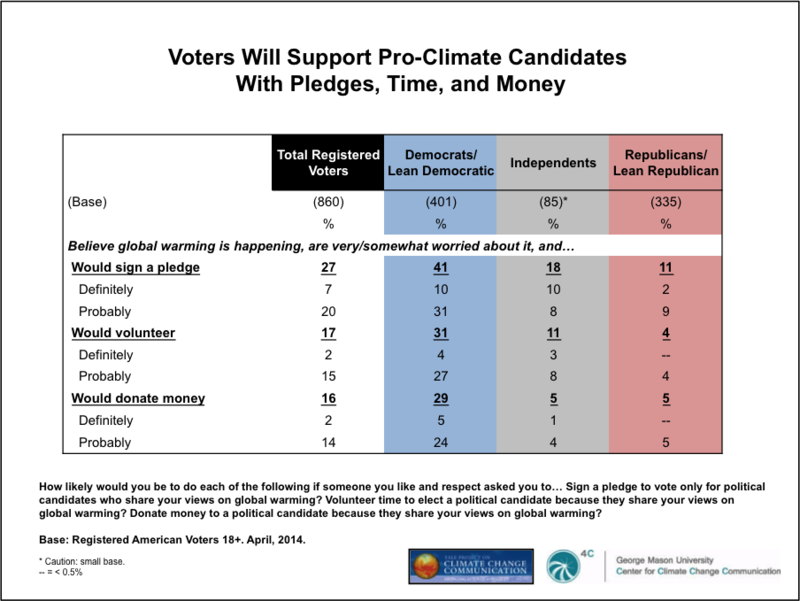 Some Independents would also donate money to a candidate who shares their views on global warming (1% definitely; 5% in total), and some Republicans say they probably would do so as well (5%). Taken together, these results indicate that there are millions of registered American voters willing to pledge their vote and support pro-climate action candidates with their time and money. In the current survey, 51% of registered voters think global warming is happening and are “very” or “somewhat” worried about it. Projected results are rounded to the nearest half million registered voters.